How does one know if their communications is too cluttered or confusing and hindering business opportunities? I was asked to view a website and share my thoughts about the effectiveness and overall design of the site. 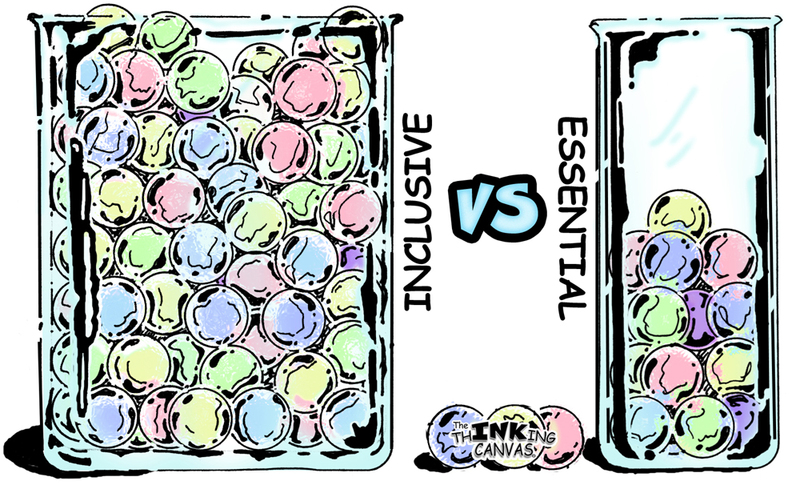 This drove my thinking to a very powerful thINKing Canvas visual analogy and then the creation of a physical activity I call “The Marble Jars” to explain what I was seeing and to help the inquirer see from a potential customers point of view. I don’t wish to explain this visual in great detail as it is very clear already. Imagine every piece of information, subject or offering in your communications (especially websites) as a marble; colors and types for various topics. Place each marble into a glass jar. Step back and look. This is how a potential customer may interpret your communications. How easily can you find all of one color or type of marble? Business communications should be designed as a call for action and not an encyclopedia of information. Visual thinking and a thINKing Canvas are great tools in looking at business communications to get a clearer picture of its purpose and value. I helped one group, maybe I can help you visualize your communications.